This is the first major museum exhibition devoted to the full scope of the career of Willem de Kooning, widely considered to be among the most important and prolific artists of the 20th century. The exhibition, which will only be seen at MoMA, presents an unparalleled opportunity to study the artist’s development over nearly seven decades, beginning with his early academic works, made in Holland before he moved to the United States in 1926, and concluding with his final, sparely abstract paintings of the late 1980s. Bringing together more than 200 works from public and private collections, the exhibition is the first to occupy the Museum’s entire sixth-floor gallery space, totaling approximately 17,000 square feet. 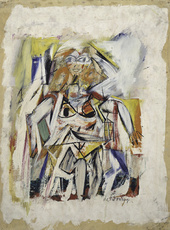 Representing nearly every type of work de Kooning made, in both technique and subject matter, this retrospective includes paintings, sculptures, drawings, and prints. Among these are the artist’s most famous, landmark paintings—among them Pink Angels (1945), Excavation (1950), and the celebrated third Woman series (1950–53)—plus in-depth presentations of all his most important series, ranging from his figurative paintings of the early 1940s to the breakthrough black-and-white compositions of 1948–49, and from the urban abstractions of the mid 1950s to the artist’s return to figuration in the 1960s, and the large gestural abstractions of the following decade. Also included is de Kooning’s famous yet largely unseen theatrical backdrop, the 17-foot-square Labyrinth (1946).